Whatever happened to Fairy Bread? As a kid, fairy bread was a staple at any birthday party. It's the ultimate party food really, well apart from the cake I suppose. It can be cut into any shape, topped with any colour sprinkles to co-ordinate with any theme and kids absolutely love it! I made these for the kids for lunch yesterday, served with some fruit salad & a glass of milk and their plates was left empty. 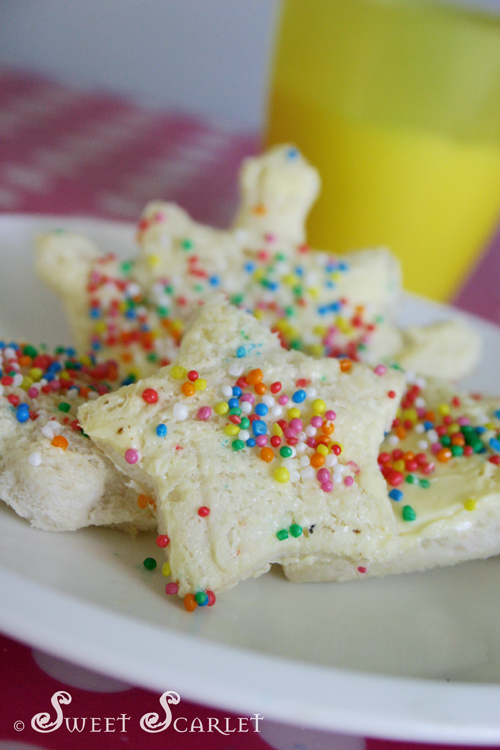 I've not heard of fairy bread before, but this is such a simple idea I am sure to try it. Thank you for posting this. I will definitly be checking back regularly, you have so many great ideas! Here is another way of making yummy wummy FAIRY BREAD. step 1:Get as much slices of bread you desire. step 2:spread condensed milk on the bread or drizzle on. step 4: HOG all the bread and EAT IT. Wow! That brings some memories back. My mum used to pack condensed milk sandwiches for lunch when I was a kid!